LAKE COUNTY – The Lake County Growth Policy was unanimously passed, approved and adopted on Aug. 21 by Lake County Commissioners. Resolution 18-33 to adopt the policy outlines a history of the document, stating that in 2003 the growth policy was first adopted. Commissioners appointed a Planning Board to plan future development within the county’s jurisdiction. The document was designed to change as the county changes. The 2018 document is an updated version. Land Solutions, LLC was contracted to write the policy with guidance from the planning board. Public hearing meetings in early 2018 were held to collect public opinion on the issue. The planning board reviewed the draft during several meetings and noted updates and changes. On April 18, the Lake County Planning Board passed a resolution to recommend that the county’s commissioners adopt the policy. Commissioners signed a resolution of intention to adopt the proposed growth policy and consider public comment on July 9 before the final reading in August. The entire policy can be found at www.planlakecounty.com, near the bottom of the page. 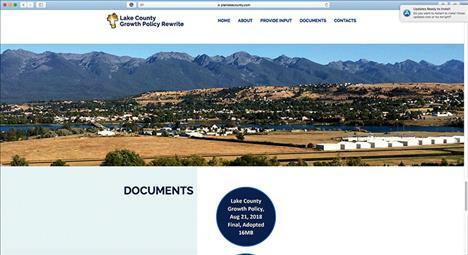 The document is located in a link under Lake County Growth Policy, Aug 21, 2018, final.